Every now and then, we enjoy a complete surprise. So it was on Sunday when we went to the New Wolsey Theatre to see The Marriage of Figaro. It is an opera full of intrigue and continues the plot of The Barber of Seville several years later, and recounts a single “day of madness” (la folle giornata) in the palace of Count Almaviva near Seville, Spain. Rosina is now the Countess; Dr. Bartolo is seeking revenge against Figaro for thwarting his plans to marry Rosina himself; and Count Almaviva has degenerated from the romantic youth of Barber into a scheming, bullying, skirt-chasing baritone. Having gratefully given Figaro a job as head of his servant-staff, he is now persistently trying to obtain the favours of Figaro’s bride-to-be, Susanna. He keeps finding excuses to delay the civil part of the wedding of his two servants, which is arranged for this very day. 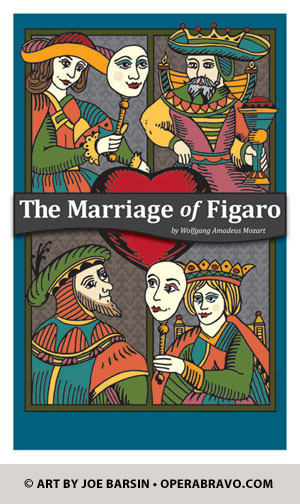 Figaro, Susanna, and the Countess conspire to embarrass the Count and expose his scheming. He responds by trying to compel Figaro legally to marry a woman old enough to be his mother, but it turns out at the last minute that she really is his mother. Through Figaro’s and Susanna’s clever manipulations, the Count’s love for his Countess is finally restored. The nine performers were from the Swansea City Opera. It was a fantastic evening. The theatre was full and as far as I am aware no one fell asleep.